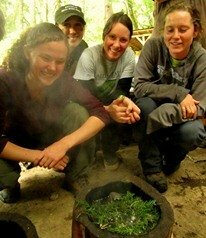 There is nothing quite like using a bow and drill to make your very own fire completely from scratch! 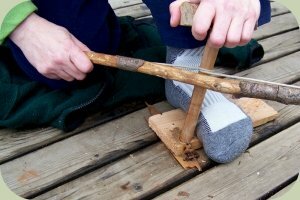 Of the many ways to make primitive-style friction fires, the bow and drill is one of the most practical methods to learn. The technique works well in nearly all environments across the globe. Collect a couple branches that are at least wrist-thick and two feet long. You can also start with lumber, rather than harvested materials. It can be easier to learn with lumber, as less carving is needed for construction. An eight foot clear cedar one by four provides ample material. The fireboard is the bottom piece where a coal is formed. Start with one of your branches or boards and cut off a 12 inch long piece. Split and whittle it down to a board shape that is 12 inches long, about two to four inches wide, and one inch deep. Make sure the bottom is flat. This small upright piece spins on top of the fireboard, creating friction and heat. Cut off an eight inch long section of branch or board. Split and/or carve it down to a dowel shape with a one inch diameter. The top end is then carved down to a tapered point, like a pencil. The bottom end is then carved down to a blunt point. The handhold is the piece that goes on top of the drill, which allows you to apply downward pressure onto the drill and fireboard. Use another piece of wood and carve it down to about the size of a full bar of soap. Round the edges so that it is comfortable to hold. On the bottom, carve in a socket that will fit the top of the drill, about a half inch deep. The handhold socket and the top of the drill should be lubricated. You can use soap, wax, waxy vegetation (such as hemlock tree needles), or almost any other type of lubricant. Be careful not to lubricate the bottom of the drill or fireboard. As a primary component of the kit, the bow is used to rotate the drill back and forth. Find a sturdy, lightweight, gently curving branch that is approximately as long as your arm with a one to two inch diameter. This makes a good bow. A six foot length of very strong cordage is needed for the bowstring. Parachute cord or quarter inch diameter nylon rope are good choices. Traditionally, cordage was made out of local plant materials such as dogbane and nettle. With practice, even rootlets and tree barks can be turned into effective cordage for a bowstring. Tie the bowstring on with a permanent knot on one end of your bow, while leaving the other end of it tied with an adjustable knot. This will allow you to adjust it when necessary. This is a small, flat piece of material which will catch and collect the dust that will be formed by the drill and fireboard. A thin, flat piece of bark, a stiff plant leaf, or a small piece of paper can work as a coal catcher. It is placed directly under the notch you will cut into the fireboard. 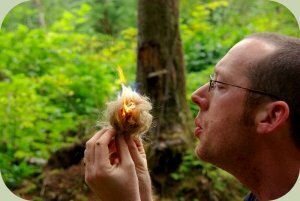 This is a ball of dry, fluffy, flammable materials such as shredded cedar bark, cattail down, fireweed seed fluff or similar materials. You can pull apart jute twine (sold at hardware stores) for a quick tinder bundle. You'll need about a softball-sized amount of tinder to use for igniting the coal produced by the bow and drill kit. 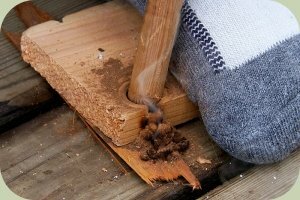 Carve in a small starter hole into the top of the fireboard, about one inch from the edge of the fireboard, to fit the bottom of the drill. Now you can wrap the drill into the bowstring so that the string wraps around the drill once, very tightly. It should be somewhat difficult to twist the drill into place. Now place the bottom of the drill into the fireboard starter hole and put the handhold onto the top of the drill. Keep the drill straight upright, perpendicular to the ground. If you are right handed, put your left foot on the fireboard (use your other foot if you are left handed), close to the place where the drill will spin. Then, place your left hand on the handhold so that your wrist is tight against your shin. This will help you keep the drill steadier as it spins, and allow for more even downward pressure. Move your right leg back behind you so your knee rests on the ground. This will create space for bowing and help stabilize your position. Now, you can grasp the bow with your right hand start moving the bow slowly back and forth. Take it slow at first and gradually increase speed. Keep going for a little while, until you see smoke coming from where the drill and fireboard meet, then stop. Take the drill off the fireboard and out of the handhold. Carve a pie-slice-shaped notch into the fireboard where the drill is rotating on the fireboard. This notch should form a little wedge that is broadest at the edge of the board and sharply tapers to a point just short of the center of the socket you just burned into the board. This will allow the fine wood dust to collect into a pile. This is where the coal will form. Make sure you have the coal catcher positioned right under this notch so that the dust will collect on it. That way you can move the coal into the tinder bundle with ease. Now you can return to bowing. Again, start off moving the bow in slow, smooth and flowing movements keeping it parallel to the ground. Keep moving the bow in a steady rhythmic flowing motion, speeding up as you go. Once you start seeing a lot of smoke, you can start speeding up even faster and applying more downward pressure with your handhold. As it starts to smoke a lot you might be tempted to stop. Keep going! Keep going until you get tired and have to stop. Check the darkness of your dust, the darker the better! You need to look closely now, and see if the little dust pile is making smoke on its own. If you see smoke coming from your dark dust pile, you likely have a coal. Let the coal sit there and burn a little bit until you can see the tiny orange glow of the coal growing. Now you can carefully move the coal in its dust bed and transfer it to the center of the tinder bundle. Shape the tinder bundle into a nest shape and partially enclose the coal. Then gently and steadily blow on the coal, until it bursts into flames. Now you can build your fire by nestling the burning tinder bundle into a well made tipi of woody materials. It is best if they are stacked so that the finest materials are on the inside, and the wood pieces are progressively larger as you go out. Now you've done it! You made a primitive friction fire with a bow and drill! 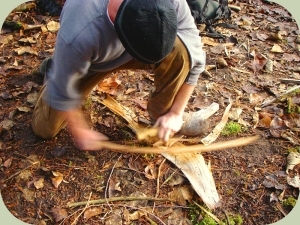 Basic Bow Drill tips from Wildwood Survival. If you are interested in learning more about exciting and empowering wilderness skills like this one, check out our Wilderness Survival Courses.